And here are my two cents on the turtle quiz. There are three species pictured in this photo. The large softshell turtle is a eastern spiny softshell, Apalone spinifera spinifera. Although this photo does not show its characteristic spines, I did see them through binoculars when this massive female was turned to the bank. We do have smooth softshells in Ohio like Jason mentioned, but they are in the bigger river systems further south. The second species in the quiz is the red-eared slider, Trachemys scripta elegans considered a non-native species in the Olentangy. There were believed to be a few disjunct northern populations along old oxbow ponds of the Scioto river south of Columbus near Circleville. However, I consider anything in the Olentangy to be either individuals that are released pets, or, perhaps these turtles are breeding in the wild now. I've never come across a baby red-eared slider in the wild, or a nesting female, but I am very much curious to know if this species is breeding in Ohio. In many parts of the world, and even out west, this species is considered a nasty invasive. They may be becoming invasive here in Ohio and only time will tell. And the third species is the common map turtle, Graptemys geographica. A turtle of rivers, I have seen them in the Olentangy, Big Darby Creek, and the Grand River in northeast Ohio. They are extremely wary and are not easily approachable. Binoculars or even a spotting scope is the best way to observe them. Best of luck searching for turtles this summer, they really are quite fascinating creatures. Wow, that really looks like the ultimate turtleQUIZ! Tom: Great post and very informative. I certainly learned from these turtle posts. Very informative and fun. If the red-eared slider is a "nasty invasive" everywhere it is found, where is its "home"? The video was interesting. I'm leaving you a "Blogging with a Purpose" award on my blog....something you very much deserve. I don't know how to actually deliver it, but hope you will stop by and copy it. Keep up the good work teaching us about reptiles and such! Videos of a nature story are the best there is. Thanks, Tom. Lana- No worries, I enjoyed your gator and turtle pictures! And no worries at all. One can only read so many blogs in a day! 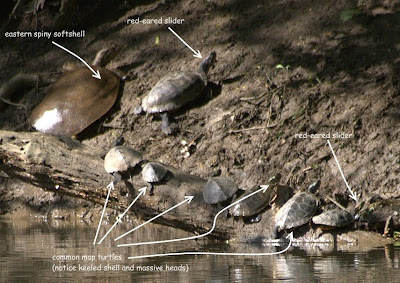 Guy- Thanks a bunch, keep on the lookout for map turtles in the Cuyahoga, especially with the MF and Kent dam removal projects. Mary- Thanks very much. That is a great question. Red eared sliders are native to eastern and southern Indiana, most of Illinois, extreme southern Ohio, parts of WV, then on to Tennesee, Missouri, and on down to Kansas, Oklahoma, Texas, Louisiana, Mississippi, Arkanas, and Alabama. I've used the Peterson's field guide map for this description. And THANKS A BUNCH for the blog recognition! FL- You are welcome. I'm missing the warm sunshine of Florida on a cold, gray, Ohio day like this one! Ok, it isn't that bad, really! I guess that makes the red-eared sliders here "natives". You can't get much more southern Indiana then where I am. Thanks for identifying the skink for me!